1. 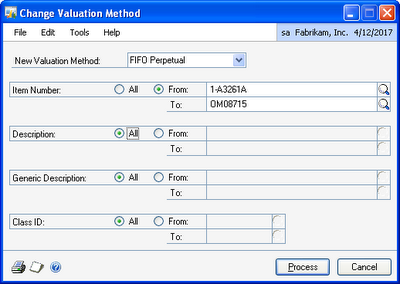 Select a new Valuation Method. 2. You can choose to change all items or a range of items based on Item Number, Description, Generic Description or Class ID. GP will filter the items based on multiple range restrictions. Note: There can be no items on unposted transactions prior to performing the revaluation. All item transactions must be posted! 3. Prior to processing the change, it is advised that you print the Valuation Method Change Audit report by selecting File>Print, or by clicking the printer icon in the lower left corner of the window, to verify your item selection. 4. Click the 'Process' button. The valuation method will be changed for the items selected. Important!! This process DOES NOT create a Financial Batch to restate your GL inventory balance(s). This must be done manually. 5. Print an Inventory Stock Status report immediately before and immediately after running this Utility. The difference between the values on the reports will be the basis for the journal entry.